As a pen clerk, I have the pretty great responsibility of getting to know each of the pens we carry, and some of the ones we don’t. Trying out new pens is an absolute blast, however, I try to be a bit more discerning when it comes to bringing new pens or inks or stationery into my own personal fold. As much as possible, I’d like to make sure that the pens (and inks and stationery and notebooks…) that I have and keep are ones that I love and use and are going to keep using, and not just have for the sake of having. With new pens and inks coming into the shop all the time, and despite all my good intentions, I must admit that I do have maybe a few more pens than the average person may need. On occasion, especially with yearly new Lamy Safari + Al-Stars coming out, I’ve passed along a few pens, but I certainly do have more pens than I can use at once. In my pen roll, I keep pens that are inked, and often these guys stay there for a while, since sometimes it seems like the next natural step, to just refill a pen that’s been working so well for you. There are times I look at the pens that I have cleaned and stored and realize that there are a few that I haven’t used in a long while. Rather than just having pens sit in your closet or in your desk, unused, here are a few strategies you can try to bring them out again. Remember that sometimes a pen that hasn’t been used in a year, or two, or more can feel like a brand new pen to you once you’ve inked it up again! Just go digging. Consider getting a new nib for an old pen, especially if a bum nib is what’s stopping you from getting your pen out. Or, sometimes you may like a pen, but over time your preferences for nibs sizes may have changed and a new nib may just give a pen some new life. You can always keep your old nib and have some flexibility for the future. 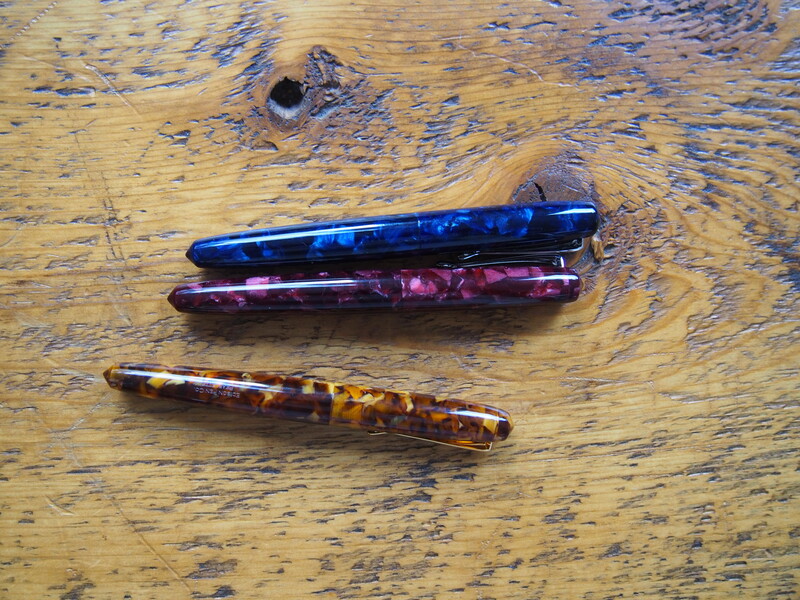 Even if your local pen shop doesn’t carry spare nibs regularly, often times you can special order them. Swap pens with a friend. If you haven’t used a pen in a while, but you’re not sure you’re ready to let go out of it completely, consider swapping a pen or two with a friend so you both get to try something ‘new,’ to see how you like it. Especially if it’s a lower-value pen, “lend” a pen to someone you know who’s not writing with fountain pens – it’s a good way for someone to try a pen with no pressure, since they don’t have to pick a pen out of maybe dozens in a shop or online. Be very, very aware that no matter how many suggestions or warnings or instructions you may give, that you may not be getting your pen back exactly the way you had it, or maybe not at all. For me, this is okay, because I have so many other pens, anyways! Find a purpose for it, like your gratitude journal, or making notes at a specific location, giving you an opportunity to really use it. Try a new ink sample that you would ordinarily never pick, and put it in your pen. Sometimes an unexpected match may surprise you with how well it works out. Just by simply using your pens, you may remind yourself of why you liked this pen so much in the first place, which would be great! Sometimes a new pen or a new tool can give you some inspiration, or make you feel like writing again. On the other hand, by really giving a good try-out of a pen you haven’t used in a while, you may discover that this pen really isn’t for you, and that may be a good opportunity to give it a new home. Or, if you’ve lent it to a friend that loves it, maybe you’ll realize you didn’t really ever like the pen as much as your friend did, and that’s where the pen belongs. The whole point is that sometimes you just have to dig out your old pens, give them a good cleaning, and see what they’re up to. I tend to like using the same pens over and over, sometimes even refilling them with the same ink! But when I take the time to dig out pens that I’ve stored away, sometimes it’s a real treat to have a pen that feels like it’s new to you. One of the best parts about being in this business, of running a pen shop and selling stationery, is the hope that we’re helping people write whatever it is that they’re writing -notes or journaling or a novel or letters or doodles. And so the hope is that the pens and inks that you get from us are serving you well, and not just kicking around in some desk drawer. Some pens are works of art, and some are workhorses, but my personal philosophy is that pens are made to be used. In other news, Caleb and I have been going for more walks in the halls of the building with this cold weather, since he is apparently not a mitten or glove kind of a kid, and his hands are always freezing at the park. We’ve been meeting some of our neighbours including one very friendly Labradoodle, and a cat. I’ve been trying to convince Jon we need a cat, since Super is too big to really curl up in your lap, although not for lack of trying. Caleb enjoys things like pushing buttons, and there’s a very, very slow elevator that goes between two floors, and that is just the bees knees for a one year old. The dumbest thing of all is that the the only button low enough for Caleb to reach on his own is the call-for-help button, so I’m constantly swatting away curious fingers. There’s also a crazy freight elevator that we haven’t tried yet – it’s the kind where you have to physically open the doors vertically yourself, and hold the button to keep the elevator moving up or down. It’s just a wire grate between you and the walls, so best keep your arms and fingers in for the ride. We’ve got some exciting things coming up including some new pens from Waterman and Platinum, and we’ve got the Pearlettes from Edison’s production line, all already in the shop, heading online soon. I’ve already got a Pearlette (guess which one) in my pen roll, so look forward to a review of that coming soon. But most exciting of all, we’ve got a big shipment of stuff from Life Japanese Stationery. It’s no secret that Life makes some of my favourite stuff including their Noble Note line, and their L-Brand Writing Paper. 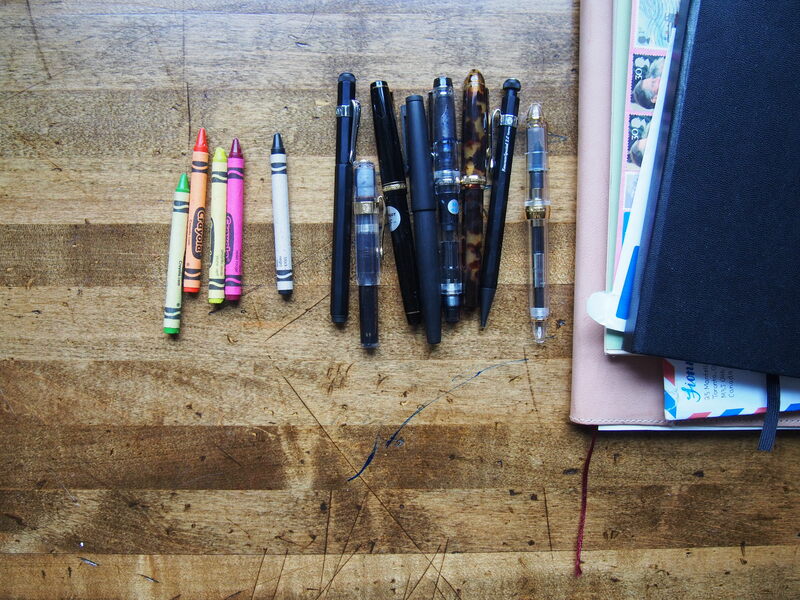 We’ve restocked all the good stuff, and we’ve got a few new things coming in that I can’t wait to get my inky pens on. *…that is a joke, because El Capitan has done nothing but slow down my wifi, which is why I now write my blog posts while eating ice cream directly out of the tub. Oooo. New Waterman and the Edison Pearlette? Very nice. Do you like Waterman? Ever since I got my first one from you guys I’ve been hooked. Excellent pens. I cannot say enough good things about the Waterman Perspective. I love Waterman!! I don’t know what took us so long to bring them in, along with the inks. Actually, we thought about bringing in the Perspective this time, but we brought in the Carene instead, which is a real beauty. I just got a Pearlette, so I think the Carene might be next on my list! Some old pens are not used because they are ill. They need more than mouth to mouth resuscitation. Have you found a local or Canadian pen doctor? We do have someone!! Jeffry has done some pretty amazing things for my own pens, so I can whole heartedly recommend him. Can you send us an e-mail info@wonderpens.ca and we’ll pass along all of his contact information? That’s a great way to organize and also to keep your pens into rotation. Let me know how it goes! I got a Pearlette, too, the Aztec golden/brown one, and I love it!! I also have a Beaumont, but this Pearlette has a really clean look to it. Just wanted to say (and can’t comment on your original thread on the subject) but your new blog looks great except that every link seems now to be broken. So on the shop site when you have links to blog posts on items you are selling, the links don’t work. Then on the blog, if I click on a tab at the top for “On Writing” for instance, the page for the links comes up but all the links are broken since they are for the old blog I guess. Yikes, bit of a nightmare for you. Or maybe not–see what your tech people say.